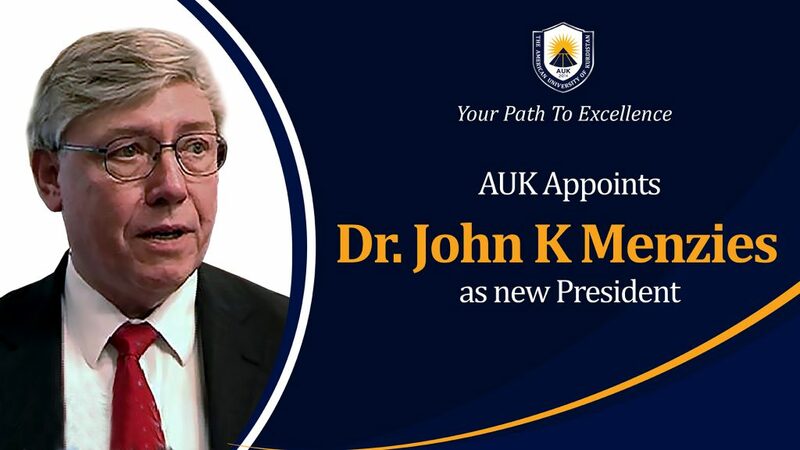 Duhok, Kurdistan Region of Iraq – May 16, 2018 – The American University of Kurdistan announces the appointment of Dr. John K Menzies as the new president of AUK. Dr. Menzies will be the new interim President of the American University of Kurdistan. He was born in Illinois, but has lived in West Virginia, Kansas, Arkansas, Iowa, Texas, California, New Jersey, New York, and Virginia in the U.S. He holds B.A. in History and German, and his M.A. is in German. He completed his Ph.D. at the University of California, Berkeley, and then joined the U.S. Foreign Service. Dr. Menzies served in U.S. Foreign Service posts in Hungary, East Germany, and Bulgaria. He was assigned to the U.S. Mission to the United Nations in New York, and to the office of the Coordinator for the Support for East European Democracy (SEED) program in Washington. From 1997 to 1999, Ambassador Menzies was a Jennings Randolph Senior Fellow at the United States Institute of Peace as leader of the Balkan working group. Honors include the Department of State Superior Honor Award, an American Bar Association Award for dedication and service toward advancing the rule of law, several honorary degrees, and the Bulgarian Order of the Madarsky Konnik. He also received the Community of Christ International Human Rights Award for the year 2000. In 2014, he was awarded the Presidential Medal by the Republic of Kosova. After his Foreign Service career, he was named the President of Graceland University, Lamoni, Iowa, where he served for four years. Then he moved on to be Dean of the John C. Whitehead School of Diplomacy and International Relations at Seton Hall University in South Orange, New Jersey, a position he held through 2013. ‘’I am delighted to be coming to AUK, Duhok, a region which is new to me. Throughout my academic studies and government service, I have remained engaged with universities. I have sent a large number of students to the U.S. from the countries where I have served. I established a university in Blagoevgrad, Bulgaria, which has become an important educational institution in the region. Education is vital to every country, and the American model, is very adaptive and has proven effective in many other nations. I am deeply honored to have the opportunity of working at AUK, and with students, staff, and faculty. The challenges of a new institution are exciting. Together, we will meet every challenge, and contribute to the wellbeing of the people of the region.’’ Said Dr. Menzeis. The vision of The American University of Kurdistan is to be recognized as a premier institution of higher education in the Middle East and beyond by cultivating academic excellence, fostering creativity, and engaging in the highest caliber of applied research.